DairyNZ are actively working with councils, farmers and other regulatory authorities to help ensure sound policy development. The following outlines a monthly snapshot of DairyNZ's current involvement. The Ministry for Primary Industries is currently reviewing the DIRA Act to assess whether it remains fit for purpose, with a key focus on examining whether the Act will support the dairy industry’s shift into higher-value markets. DIRA was introduced in 2001 to facilitate the formation of a national dairy champion – Fonterra – to drive the performance of New Zealand’s dairy sector in the global marketplace, and to regulate Fonterra’s dominant position in the domestic milk market. The review is also assessing whether the requirement for Fonterra to accept all applications from farmers to become shareholders (and therefore accept their milk supply) has produced unexpected environmental consequences, by providing incentives for the dairy industry to expand into areas of special environmental sensitivity. MPI convened a series of nationwide workshops, and it was good to see dairy farmers turning out in large numbers to express their concerns and hopes for the future. Public submissions closed on 8 February and MPI are scheduled to make final policy recommendations to Government before the end of April. MPI is currently consulting on design options for a proposed Farm Debt Mediation Scheme that would require the secured creditors of farm businesses to offer statutory mediation before taking any enforcement action in relation to outstanding farm debts. The Scheme would also enable farmers to initiate statutory mediation. The expectation is that the Scheme would provide a structured negotiation process in which the mediator, as a neutral and independent person, assists the creditor and farmer to communicate effectively, to identify and resolve matters relating to farm debts and capture agreed outcomes in formal agreement. Similar Schemes have been operating successfully in Australia, with the MPI team looking closely at the New South Wales (NSW) model. One of its key features is the provision of financial counselling services to farmers prior to the mediation process. We’ll be working closely with MPI over the next few months to identify what kind of counselling services could be usefully provided to support any NZ farmers who may be experiencing financial distress. At the end of last year MBIE released a discussion paper exploring options for delivering on the Government’s commitment to strengthen labour market testing and ensure that migrants are plugging genuine regional and sector skills shortages. Introducing a new framework for all employer-assisted temporary work visas which will be employer-led, rather than migrant-led, and will simplify the system by reducing the number of application pathways into one enhanced framework. Replacing the Essential Skills in Demand Lists with Regional Skills Shortage Lists to better reflect the skill shortages that exist in the regions and provide a stronger signal to temporary migrants of opportunities in regional areas. Introducing sector agreements to ensure longer-term structural issues are addressed, so that sectors or industries do not become reliant on migrant labour, at the risk of shutting out opportunities to New Zealanders. Improving alignment of the immigration, welfare, and education systems to improve how we work together to increase the employment of New Zealanders and deliver better labour market outcomes for New Zealand. DairyNZ has formally submitted in March on behalf of the dairy sector. Over the next 18 months world leaders, ministers and policy makers will be deciding on a new set of global targets to stop the decline in biodiversity around the world. This process builds on the Aichi Biodiversity Targets which were agreed in 2010, to enhance the implementation of the Convention on Biological Diversity (CBD). New Zealand is a signatory to the CBD, and the Ministry for Foreign Affairs and Trade is currently seeking feedback on how we can continue playing our part in contributing to the development of a new 2050 vision and strategy that ensures “biodiversity is valued, conserved, restored and wisely used” around the globe. MFAT is also keen to hear how this international process can be linked to work that is currently underway to develop a new national biodiversity strategy. Submissions close on 31st March and DairyNZ will be making a formal submission on behalf of the dairy sector. The report was released on the 21st February and contains far-ranging recommendations regarding the establishment of a capital gains tax (CGT) and a raft of potential environmental tax measures. The Government has indicated that it will release its response to the Report in April 2019 as soon as it’s had the opportunity to consult Coalition and Support Partners and build consensus for next steps. In addition, any changes to the tax system will not be implemented until 1st April 2021 so New Zealanders have a chance to have their say on the package at next year’s general election. In the meantime, the Government has emphasised that the family home and the land immediately surrounding it will be excluded from any new CGT, and that the Labour/NZ First Coalition agreement specifically prevents the introduction of any water taxes during this term of Government. The Essential Freshwater Package will be released by the Ministry for the Environment in April and we will keep you informed on what they release when it comes out. 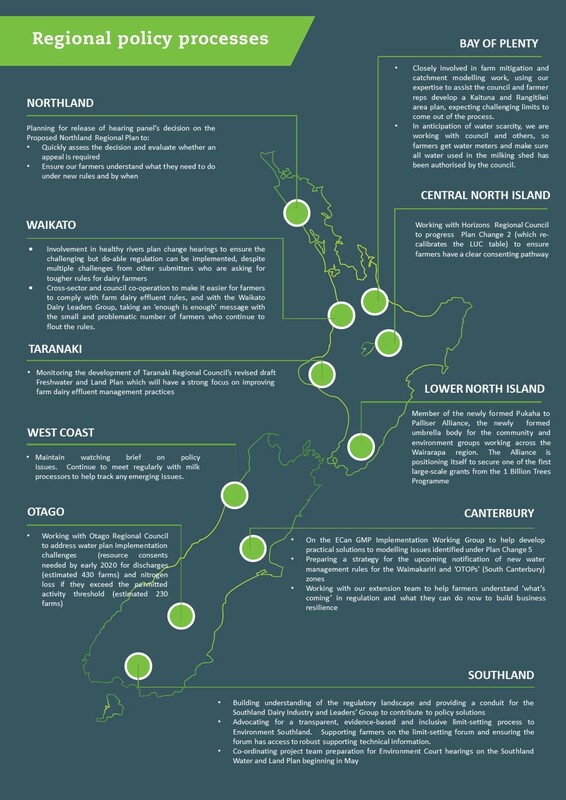 An overview of DairyNZ's involvement in policy at a regional level.